Annual Report of the New Zealand Geographic Board Ngā Pou Taunaha o Aotearoa. Presented to the Minister for Land Information as required by section 14 of the New Zealand Geographic Board (Ngā Pou Taunaha o Aotearoa) Act 2008. 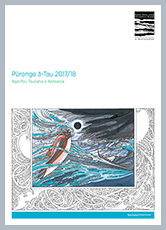 The 2017/18 annual report can be downloaded as a PDF in both English (PDF 1MB) and Te Reo Māori.